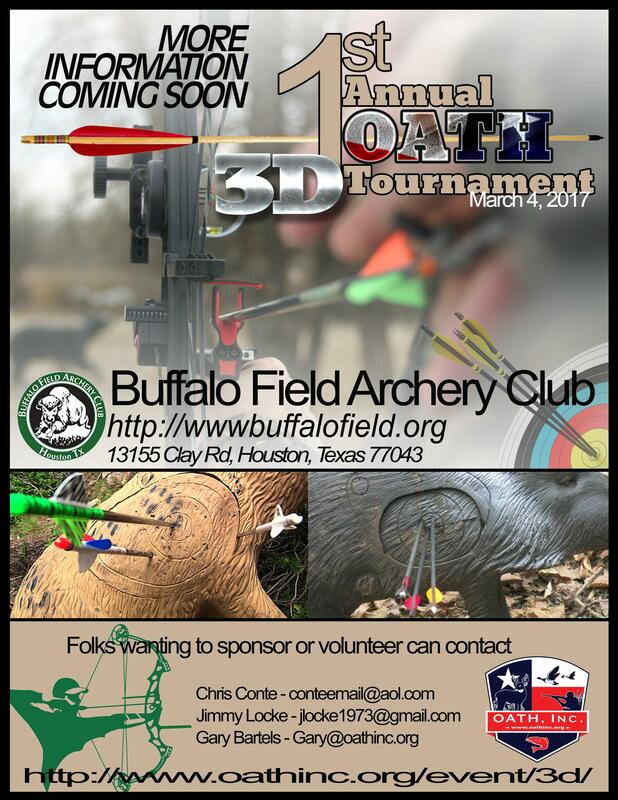 1st Annual OATH 3D Tournament – OATH, Inc.
On March 4th, 2017, Buffalo Field Archery Club (BFAC) in conjunction with the Houston Bow Shooters will serve as partners with and host to the 1st Annual OATH 3D Tournament. Our goal is to make this shoot the largest single day competition in the state, not including Pro/Ams, which will in turn make it the largest charity shoot in the state, so we can raise a ridiculous amount of money for OATH to continue their good work supporting our returning military. The goal for this, the very first shoot, is 240 shooters – 60 4 person teams shooting across 2 30 target courses. OATH will provide up to 50 volunteers to handle the auctions, registration, food, etc., and BFAC will be solely in charge of anything to do with archery, their facilities and safety. We will be in need of general sponsorships, food sponsorships, prize sponsorships, auction items, etc., so if any corporations or individuals are inclined to open their hearts and wallets to support this event and organization, please notify Chris Conte, and all the necessary paperwork will be made available. If you would like to volunteer now, later, or support this financially or through some other unique way you might have in mind, please contact Chris by email – [email protected], put OATH 3D SHOOT in the subject line, and he’ll reply as soon as he can. Join us in making this 3D Tournament the BEST IN THE STATE !! !